Vice President files complaint against "The Chronicle"
Accra, June 14, GNA - Vice President Aliu Mahama has lodged a formal complaint against "The Chronicle" at the National Media Commission asking it to investigate two publications that allegedly sought to tarnish his reputation and diminish his popularity and take appropriate action against the newspaper. The compliant, filed on his behalf by the legal Advisor of the Office of the Vice President, Mr O.B. Amoah, cited front page lead stories: "Aliu Fails Again... Disappoints Tamale Traditional Chief, Elders;" and "Ghana's Bogus $3.5 Million Debt... Kolon Agent Misled Veep? "In the June 8 edition of The Chronicle, its correspondent from Tamale without any basis made damaging, false and libellous statements that the Vice President had failed to recognise the head of the Tamale Traditional Authority and had 'deliberately' failed to 'actively aid the settlement of the Yendi Crisis' and had become a 'factor of division,' " the complaint statement said. 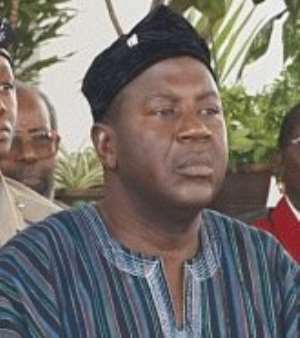 The statement explained that the deliberate reference to Dagbon, when the Vice President's recent official tour only covered the Mamprusi Districts in the Northern Region and the Upper East Region, was aimed at serving a negative purpose of inciting the public and inflaming the passions of the people of Dagbon against the Vice President. "The Chronicle" story had blamed the Vice President for refusing to pay a courtesy call on the Chief of Tamale during the tour. However, the Vice President did not visit Tamale, he was based in Bolgatanga throughout the tour. In the case of the Kolon story, the statement said May 14 edition of "The Chronicle" "deliberately made false and libellous statements against the Vice President that he had interfered with the proceedings and influenced the outcome of arbitration to the detriment of the Republic of Ghana because he had personal interest in the matter between Kolon UK and the Government of Ghana." The Vice President is, consequently, seeking a retraction and an apology and an undertaken from the newspaper to cease the publication of such unfounded and fabricated stories against him.